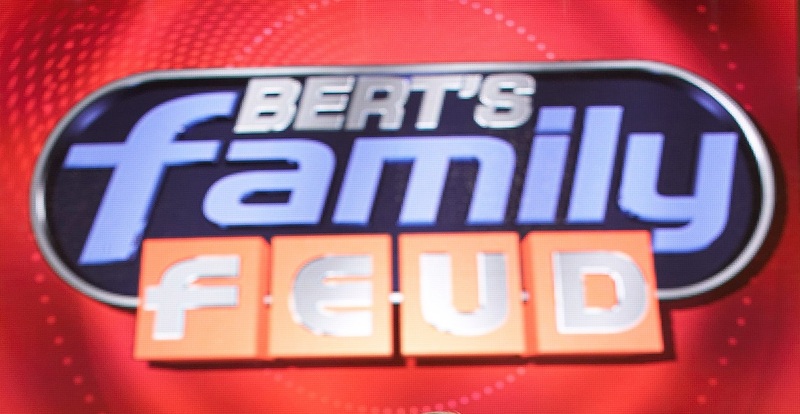 MORE ‘Family Feud’ tips straight from the Executive Producer! SH: So you have to be in touch with the general population, because that’s where the show’s content comes from, from surveying the general population. MP: Yeah. Out of a hundred people, 75 would say “Gillard”. That would not be a good question… because it’s so easy. And if 75% have used up the first answer, then the remaining 4 or 5 answers are spread among 25 respondents and so imagine: “On the board, how many people said Gillard? 75!” That so skews the score in that team’s favour. So you wouldn’t do that. As you wouldn’t do one where the answers all sat around between 10 and 21%. so you’re looking for a question that gave a maybe 30 answer as a top answer and then there was a 23 second answer and then there was 3 answers in the teens and then there was a 7 and an 8. They were the beautiful questions. SH: Can you remember who the show’s biggest winning family was, and what they won or how much they won? MP: I remember there were some serious winners. Because that was a carry-over champion scenario where if you went 5 nights you won a car. So it was less about the money and more about a car. But maybe there was a hundred grand available. You could agree to leave after your 1st or 2nd or 3rd night or you could go all the way to five nights. That’s the other thing that has to be remembered about Family Feud if you’re a producer; “Do we want to see these people for longer than one episode?” Because on Millionaire and Price Is Right and others, they’ve gone! Suddenly we have the Smith family and they’ve won. And they win again, and now this is the third night, and Bert is trying to find something new to ask about these very boring people. You might get them through on a one-off appearance, but suddenly they’ve won every night and for 5 nights you’re watching The Boring Family. So therefore you have to raise the bar as to who you accept, because of the repeat appearance. SH: And I guess that’s where the host comes into their own too, isn’t it? Was it clear when he ever didn’t like families, and if so how did he deal with them? MP: Always a professional, so the viewer would not have read it. We probably read it. Yes, there were certain families that anyone would have passed over. The technique was blaming time; “Oh that’s great, but we’ve got to move on…” so you’d get on to the question or the next person. And then once you’ve seen that the aunty second from the left is to be avoided, you’d quickly get her answer and move on, you wouldn’t ask leading questions. Because the joy of Family Feud – like any game show – is meeting the people. Millionaire is not a Q and A show, Millionaire is a display of various people under pressure. Certainly in the hands of Ed and the way he plays it and soforth. The Einstein Factor I think is a more Q and A show. You’re there to test yourself at general knowledge because there’s many more questions over the half hour and there just wasn’t that rapport in the byplay between the host and the contestants as there is in millionaire. Deal Or No Deal is about the relationship between Andrew and the contestant, and secondly there’s the guessing game. And if you look at Millionaire, there are 15 questions, and the total time of those might be 10 minutes? The show runs for 24, so the other 14 minutes is all about relationships. And so in casting – and it’s similar with Family Feud – you’re primarily looking at the relationships. SH: And before we move on from Family Feud, were there any controversial moments or stories from the show? MP: No. No, I don’t think there were. Audience members sometimes say “Oh, what’s happened that we don’t see on TV?” And the sad answer is “very little”. Because the formats are so tried and tested and everyone doing their job is so professional, there’s very little left to chance. And if something crazy does happen, most likely we’ve left it in and so you can see it on TV. And that’s where we left Family Feud. But there’s still plenty more of the interview to come, with Michael candidly discussing his time on The Price Is Right and Who Wants To Be A Millionaire. That’ll all be coming up soon, so keep checking back here! * At the time of this interview, Julia Gillard was the Prime Minister of Australia. This entry was posted in 'Family Feud', Auditioning, Updates by Stephen. Bookmark the permalink.